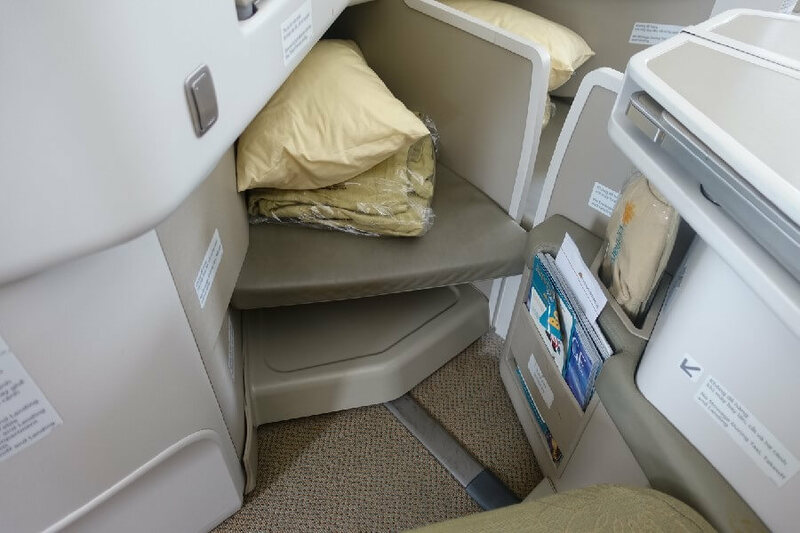 You are here: Home / Dream / Business Class Airline Reviews / Vietnam Airlines review: what is Vietnam Airlines Business Class like? Hi Frugalistas! Before you say this post isn’t for you, I’m letting you in on a secret…….if you are an Australian who is planning a trip to Europe, or a North American planning to travel to South East Asia, I think I’ve found a great travel hack for you. So please read this Vietnam Airlines review – it’s worth it. Mr Frugalfirstclass and I took our first trip to Vietnam last December while MissG was in Europe. 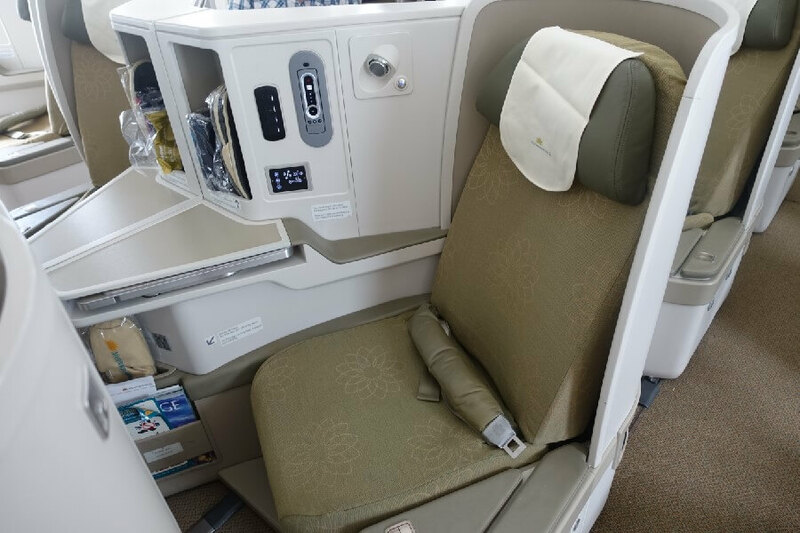 According to the Vietnam Airlines website, they are proud to be a Skytrax 4 star airline, and the Vietnam Airlines fleet includes the fabulous 787 Dreamliner which they fly to Australia. I had high hopes. So what is Vietnam Airlines like? 2.3 What is Vietnam Airlines Service Like? 3.1 So here’s the hack I told you about earlier……. In Sydney, Vietnam Airlines uses Qantas ground staff. When we arrived the check in queue for Economy was lengthy – it was only a couple weeks before Christmas and obviously many Vietnamese Australians are already visiting relatives back home, given the large amounts of boxes in the luggage. Fortunately, Business Class had its own separate check in, so we didn’t need to wait. Our cheery Qantas staff member had us on our way in no time, complete with Express Lane passes for Immigration and Security. It’s so quick that we actually spent longer waiting for Mr Frugalfirstclass’ new passport to clear at Immigration than at the check in. 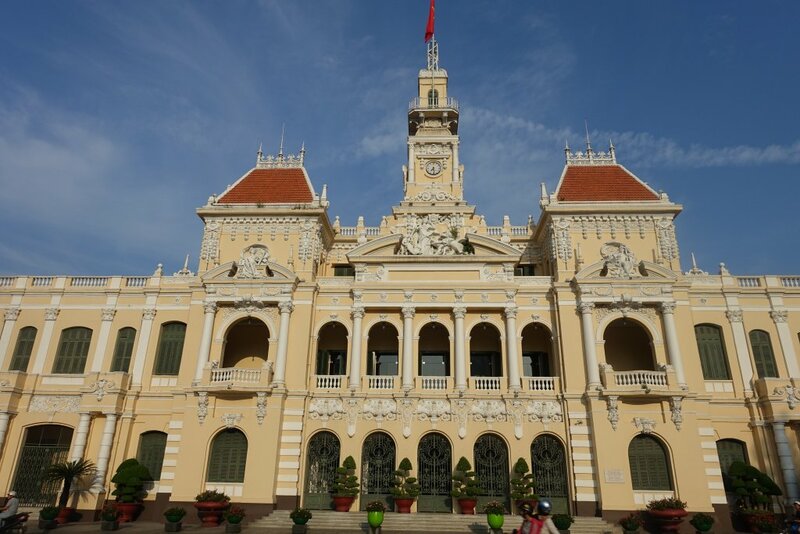 Our return flight to Sydney was from Ho Chi Minh City (Saigon). We had been checked through from Hanoi, so did not need to check in at HCM. There was no separate Express Lane for Business Class travellers to clear Immigration, but despite the length of the queue when we arrived, processing for Immigration and Security Screening was both prompt and efficient. The Vietnam Airlines Sydney Lounge is the newish Skyteam lounge. 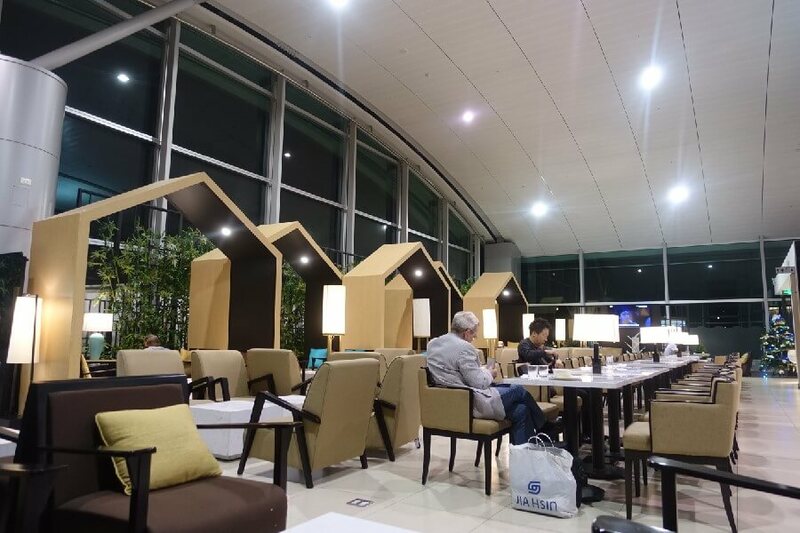 Our flight happened to coincide with a China Southern a380 flight as well as a Delta flight, so as you can imagine the lounge was crowded and somewhat noisy. The poor staff also couldn’t keep up with the catering. Fortunately we didn’t need to eat. What I did see looked perfectly reasonable though, and despite it being only mid-morning a respectable amount of wines, beers and spirits were available via self service. Amenities in the Sydney Skyteam Lounge included wifi, plenty of varied seating, a work area complete with desks and computers (actually, almost like an office environment – I must say it was one the best work areas I’ve seen in a lounge) and very modern and well maintained bathrooms. Despite the busyness of the lounge, the bathrooms were spotlessly maintained. The Vietnam Airlines Lounge in Ho Chi Minh City was again spacious, with plenty of seating choices. The bulk of the food was Vietnamese (including a make your own pho bar), although salads and some Western choices were available. I was thrilled to see that the ingredients to make Vietnamese coffee was available and also that I managed to make myself a reasonable version. A choice of two white wines and two reds (one French, one New World) and a small selection of spirits is enough to enjoy a quiet drink before departure. Boarding was conducted in an orderly manner with priority boarding for Business Class passengers on both our international sectors. The Vietnam Airlines 787 is configured in a generous 1-2-1 seating configuration. With its beige and pale yellow interior, it had a calm and airy vibe. Mr Frugalfirstclass and I were seated in the middle section in side by side seats. For solo travellers there is no real screen between the two seats, although the bulkhead like arrangement between the seats did add some privacy. While there wasn’t a huge amount of storage I did find enough room for my reading material, camera and water bottle. Being in the centre of the cabin there was no overhead locker, but the side overhead lockers had plenty of space. The actual Vietnam Airlines seat was an interesting affair. It is a fully lie flat seat, which utilises a fixed foot stool to convert it into a lie flat, like most lie flat seats these days. The seat was fully adjustable. I found it quite comfortable to sit back and relax in. When it came time to sleep I did find the tapering of the seat into the foot well meant my feet were a little cramped. At 185cm (about 6 foot 1) Mr Frugalfirstclass found the seat was not quite long enough for him to lie with his legs out straight. Despite that we both enjoyed a pleasant nights’ sleep on our overnight flight from Ho Chi Minh City to Sydney. On both legs we were provided with a pillow, and an acrylic (yes, like they use in Economy) blanket. There was also a pair of slippers in each seat pocket. Our amenities kit was a very useful dark blue Parfums Charriol toiletry bag complete with a folding brush and comb, lotion and lip balm (both of which were very, very good), and good size toothpaste and toothbrush in addition to the usual ear plugs, eye shade and socks. In the loos there was mouth wash, hand lotion, as well as razors and shaving cream. I found that the bathrooms were kept to a reasonable standard throughout the flight. What is Vietnam Airlines Service Like? I was intrigued to see what the Vietnam Airlines service would be like. Vietnamese people are extremely friendly and hospitable, and generally speaking our Vietnam Airlines inflight service experience reflected that. The cabin crew seemed quite young, and while their English was not always brilliant, the service I received was always polite, if a little reserved and earnest at times. On the return flight, my young male flight attendant greeted me particularly warmly, introduced himself and asked me what I would like him to call me during the flight. Of course I said “just Jo is fine.” So throughout the flight he then proceeded to call me “Miss Joanne.” It was terribly sweet, albeit a bit formal. Throughout the flight call buttons were answered promptly, bottles of water were brought and top ups of wine were an absolute given. I love Vietnamese food. It’s so light, fresh and tasty. 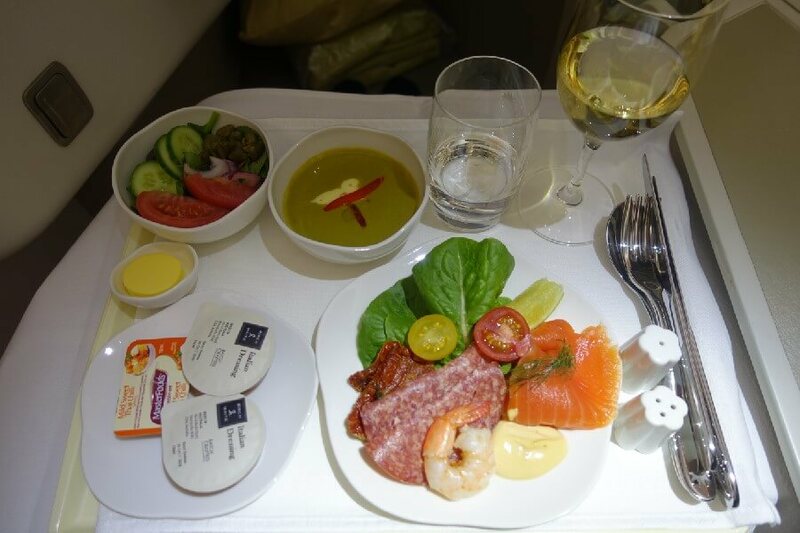 And while the food in Vietnam Airlines Business Class was fresh and light, it wasn’t always particularly tasty. We found it a little on the bland side at times. But when it was good, it was very good indeed – our dessert of Sweet Soup was superb. Mango flavoured rice, it was absolutely delicious, and would definitely not have been out of place in a restaurant. Meals were served with linen tablecloths and napkins on trays. Serving sizes were generous. A choice of breads was offered from a basket, and seconds were not only offered, but encouraged. I particularly liked that while the meal service was not rushed at all, once finished, trays were taken, and tray tables put away very promptly. Along with the French Champagne served prior to take off (Metropole, not a premium label, but very drinkable all the same) we were offered a choice of two red wines and two white wines with our meals. Glasses were generously poured, and top ups were proffered without asking. The wine list also offered a range of spirits and “Signature Cocktails”. I particularly enjoyed my Saigon Sunlight of whiskey, lemon juice and lemonade. Quite coincidentally, as I was writing this post I received an email from a PR company advising that well known Australian Vietnamese chef Luke Nguyen was joining Vietnam Airlines as its Global Cuisine Ambassador. 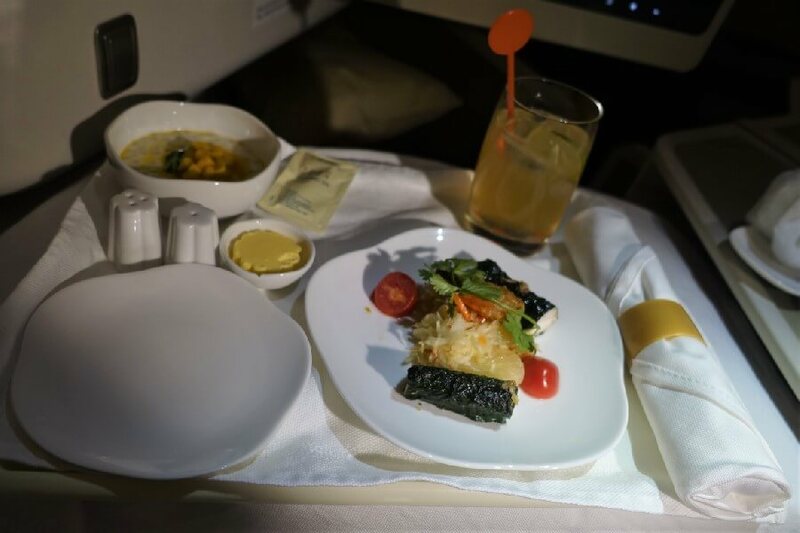 With a mission to further promote Vietnamese culture and cuisine to the world, Luke will be developing eight dishes to be added to the Vietnam Airlines Business Class menu on flights from Australia. In addition, he will be consulting on another 50 dishes served globally. I think tasty will definitely be the word that springs to mind on future flights. In flight entertainment was delivered via a nice big touch screen. There was a good range of new release films, and plenty of classics and children’s film choices. There were also plenty of TV shows in a variety of genres. My only disappointment was that the shows featuring various Vietnamese destinations were only screened in Vietnamese. While I enjoyed watching the screen, it would have been better to have been able to follow along with the narration. The noise cancelling headphones were comfy and good quality. Vietnam Airlines clearly wants to be a great airline. 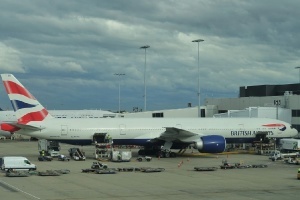 With a young fleet of good planes (they also fly the Airbus 350), earnest and polite service, and a lie flat seat, with no need to climb over your neighbour (I’m looking at you, British Airways) the bones of an excellent Business Class is definitely there. 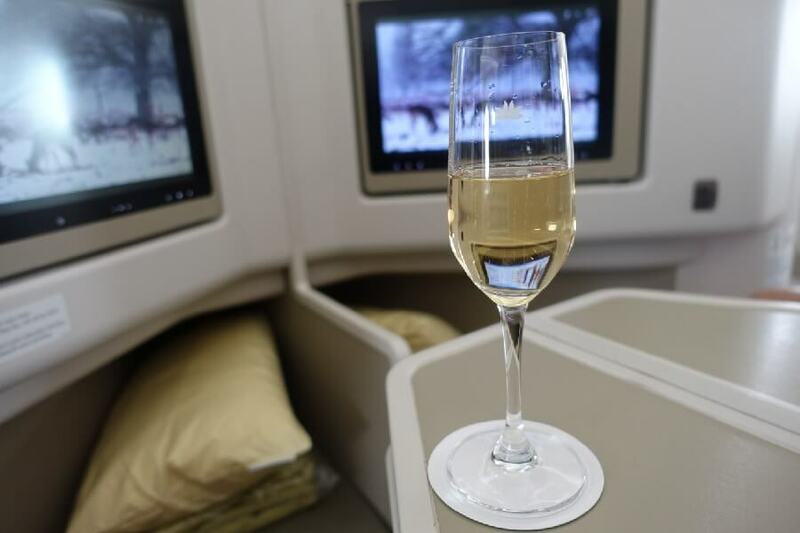 While Vietnam Airlines cannot currently compete with premium Business Class offerings like Singapore Airlines or Qatar Airways Business Class, it does what it is supposed to and it’s very keenly priced. The seats are lie flat, the food is, I suspect, only going to get better with Luke Nguyen on board, and the service is pleasant, if a little reserved. If you are particularly tall, you will struggle with the length of the bed on overnight flights, and if your idea of Business Class is premium French Champagne, restaurant quality food and a cosy quilted duvet with a turn down service at bed time, then I’m sorry, you won’t get it on Vietnam Airlines. But what you will get is a product that does a lot of things right and offers excellent value for money. So here’s the hack I told you about earlier……. Vietnam Airlines doesn’t just offer cheap flights to Vietnam. In addition to flights to Vietnam, Vietnam Airlines flies to many South East Asian destinations. But here’s the thing, what I think you will especially love is that Vietnam Airlines’ destinations to Europe include London and Paris. And they are the cheapest Business Class tickets going. 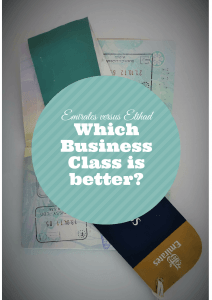 How cheap are their Business Class tickets to Europe from Australia? How does around AUD4000 – $4500 depending on the time of year sound? Yes, I know it’s more expensive than an Economy ticket on a premium airline, but it is cheaper than a Premium Economy ticket on Qantas or Singapore Airlines, and significantly better value, and not much more expensive than the underwhelming Cathay Premium Economy. 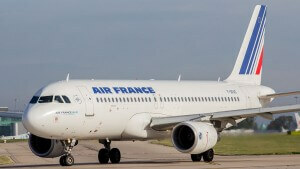 And it’s Business Class, with lounge access, a lie flat seat and a far more spacious, light and airy cabin. And you will not need to climb over anyone’s knees to go to the loo. For North American readers, Vietnam Airlines will commence direct flights to Vietnam in 2019 – a perfect way to experience Business Class when you are travelling to South East Asia from North America. I suspect Vietnam Airlines will continue to get better, and I, for one, look forward to experiencing it. Author note: Mr Frugalfirstclass and I paid for our own flights on Vietnam Airlines. Thank you so much for this review Jo. I’ve seen Vietnam Airline’s business class pricing for European flights and I’ve been wondering what it might be like to fly with them. I’ll certainly give them more attention thanks to your post. I’ve flown and enjoyed Vietnam Airlines in Economy on a short flight within Vietnam. I think the Business Class tickets to Europe sound affordable. It would be quite a lovely experience for us. Sounds like a pleasant experience. We go budget and always fly Air Asia but a first class gig is in order for a long haul flight methinks. Great review. 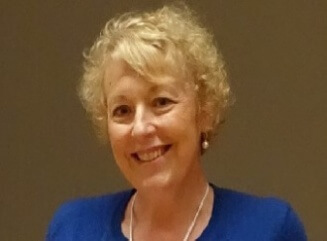 Wow thanks Jo, we having been flying to Europe for over 11 years & have just in the last few trips upgraded to Premium but I am definitely looking at Vietnam Air for our next venture! For some reason I didn’t think their business seats were flat lying? so I had always dismissed them. Not anymore though .